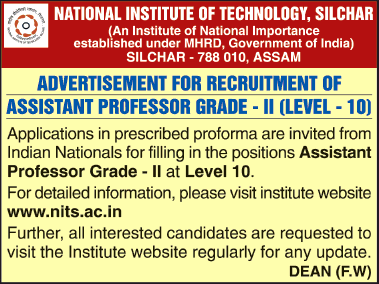 National Institute of Technology, Silchar has advertised in THE TIMES OF INDIA newspaperfor the recruitment of Teaching Faculty- Assistant Professor (Grade II) jobs vacancies. Interested and eligible job aspirants are requested to apply within 15 days from 30th January 2019. Check out further more details below. College Profile: National Institute of Technology, Silchar is one of the 30 National Institute of Technologys of India and was established in 1967 as a Regional Engineering College in Assam. In 2002 it was upgraded to the status of National Institute of Technology and was declared as Institute of National Importance under the National Institutes of Technology Act, 2007. Application Fee: Application fees of INR 1000 for General/OBC candidates & INR 500 for SC/ST/PWD candidates be paid directly to State Bank of India in the account of Director, NIT Silchar (A/C No. – 10521277057, IFSC Code – SBIN0007061). How to Apply: Interested and Eligible candidates are requested to send the soft copy as well as hard copy of the application. advertisement in Employment News up to 1700 hours.